Imagine you have never read or heard of Barbara Hand Clow, and you find yourself sitting in an audience at a workshop a friend of yours insisted that you attend. Or you’re a fan of Barbara, who finally gets to see her for the first time. An energetic, clear, intelligent woman with a long braid of blond-white hair stands at the podium. She engages you with a happy smile, makes a joke about the present political situation, then slugs down a gulp of water as she strides toward the tall poster [see Figure 12 from The Pleiadian Agenda] showing a bold vertical-axis line curving through the nine dimensions and beyond. The workshop is generally in four parts. The first evening (usually on Friday), Barbara opens our minds to topics of current importance, whether they be global news or astrological influences. 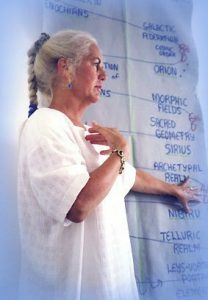 She approaches these as a Pleiadian, and students quickly realize that how she teaches is as important and what she teaches. “Don’t worry about taking notes,” she will often say, followed by, “Let this information sink in wherever it wants to go in your mind; you’ll remember it when you need to.” She is joyful and loves to crack jokes, in typical Pleiadian fashion. For those of you who have read The Pleiadian Agenda, you’ll recognize “Satya” right away as she makes irreverant and brilliant comments, typical of a fully realized, multi-dimensional being. Gerry Clow, her husband and long-time partner, complements her teachings with insights and meditations on how to receive these teachings in our bodies, drawing on his experiences as a hands-on spiritual healer, trained in Polarity Therapy and Craniosacral Therapy. During the morning of the second day (usually on Saturday), Barbara teaches the nine dimensions of consciousness: what are they, how do they feel to us, how they interrelate. Students respond by asking questions, and if they become imbalanced by accessing too much energy, they receive healings from the healers at the back of the room to remain grounded and balanced. 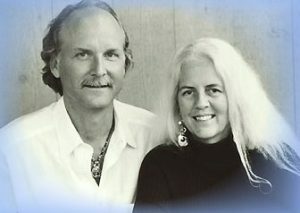 Gerry and Barbara make sure students are in clear relationship with the work being presented and are integrating it into their physical bodies, since the activation has an immediate effect on their energetic bodies. 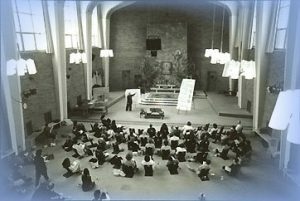 The healings occur through light, off-body touch, while the recipient sits on a chair or bench at the back of the room and the teachings by Barbara continue uninterrupted. The recipient simply listens while receiving treatment, which can take 5 to 10 minutes. Most, if not all, students remark how helpful these treatments are, whether they received one or not. Everyone in the room as a result is able to be in touch with the teachings and with fellow students. The purpose of the workshop is for all to benefit; it is an experience of making and sharing community. Often the student who is struggling may become the best teacher, by embodying how deeply we all struggle to accept our birthright–multi-dimensional consciousness. The morning session concludes with another form of learning how to be more present. Barbara teaches students to balance the six-polarities, using a diagram of a wheel with twelve slices or “houses”. The polarities are: self/other, ground/purify, link/spirit, feel/power, create/give away, be here now/bliss out. She explains how each polarity works, has each student check to see if he or she is off in any one or more of the polarities, and then gives us a technique for correcting the imbalance. The afternoon session is pure ceremony while experiencing and enjoying two hours of the nine dimensions. Barbara lays out an altar in the center of the room while participants are invited to sit and lie down, wherever feels comfortable. Gerry is in charge of the music, which is nine movie-quality sound tracks composed by Michael Stearns for each of the dimensions. Healers remain present to assist, yet most attendees are ready to integrate the experience about to unfold as a result of the morning session. Barbara says prayers to the four directions, and to the sky and earth, following her Cherokee and Maya teaching traditions. At this point, the whole feeling of the room changes, because the Pleiadians come in and they conduct the journey into the center of Earth. Each journey is unique to that workshop, group, place, and time. The music begins as she brings the group into resonance with the iron-core crystal in the first dimension. 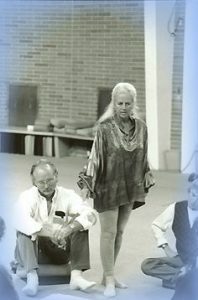 Then the group experiences each of the dimensions; some lie down, others move and dance, while Barbara does a pipe ceremony and works with the spirits in the room. The room is enveloped in the sounds of the dimensions, and the scent of sweet grass and sage. Each student is on his or her own journey, which each will be able to describe when the journey is done. The final episode of the workshop, (following the ceremony on the same day, or on the morning of the third day) is often the best because the students become the teachers. Sitting together in full circle, each student shares his/her experience of the day before. One by one, they tell who they are, why they came, and what happened. Gerry and Barbara monitor the process, responding when and where necessary, and making sure each person has time to speak in the time allotted. Previously strangers to each other, suddenly the group becomes bonded, intimate, a family. Students discover someone else from the same hometown or the same profession; someone sitting directly across the circle may mirrors the experience of another in a way that could not be seen until the other spoke. Those who sit instinctively on each of the four cardinal directions take on additional roles as teachers as they reflect the energy of those directions. What is said is real, personal, powerful, moving, often hilarious as well, and the words resound long after the circle is completed. In summary, why would you, or anyone, come to such a workshop? and to be more powerful, present, conscious in our everyday lives. The following is a sample of what students say after the experience is over.